WASHINGTON (CNN) -- The United States is working with its allies to send a "strong, unified" message to North Korea that its "belligerent" actions have consequences, the State Department said Monday. 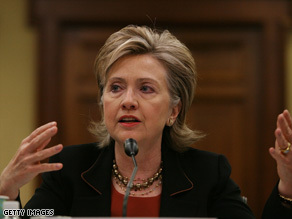 Secretary of State Hillary Clinton has been working with her counterparts on the North Korea issue. Secretary of State Hillary Clinton spoke Monday with the Russian and Chinese foreign ministers, a department spokesman said, as the U.N. Security Council debates a tough resolution condemning North Korea's latest missile and nuclear tests. "I think it's very clear that we are all on the same page with regard to the need to take very strong measures against North Korea," deputy spokesman Robert Wood said. "They're going to continue with our discussions on coming up with a strong resolution that responds to the North's violation of its international obligations." Senior officials said that discussions on possible elements of the resolution have touched on travel and visa bans on certain members of the regime and tougher trade and economic sanctions, possibly including an arms embargo to prevent North Korea from engaging in lucrative arms sales. Wood would not comment on reports that North Korea is moving missile equipment for another possible long-range missile test but repeated that missile launches by Pyongyang constitute a violation of existing U.N. resolutions. Senior U.S. officials say North Korea is moving equipment around, but it is unclear whether the regime is intent on another missile launch or whether it is just trying to rattle the international community. Wood said Washington wants the North to return to nuclear negotiations with the United States, China, South Korea, Japan and Russia, known as the six-party talks. Although the talks have been stalled for more than a year, Wood said, "just because things haven't worked doesn't mean you don't keep trying."